Forever A-Beta-CarE is an essential formula combining vitamins A (from beta-carotene) and E, plus the antioxidant mineral Selenium. Antioxidants are vital in the fight against free radicals, i.e. the chemical molecules that arise from pollutants in the body and damage healthy cells. 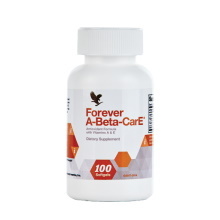 Forever A-Beta-CarE is a specially formulated dietary supplement that supplies vitamin A to the body from beta-carotene. The body converts beta-carotene to vitamin A in the small intestine during digestion or when it is needed, leaving a low risk of vitamin A overdose, which can be toxic when taken alone in large doses. Vitamin E , a fat-soluble vitamin, is an excellent supplement for healthy skin. It also protects vitamin A and essential fatty acids from oxidation in the body cells and prevents breakdown of body tissues.